Heavyweight, 65 lb. 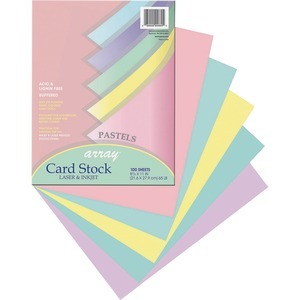 cardstock is perfect for greeting cards, postcards, report covers, rubber stamping, memory books, flyers and announcements. Cardstock works well in laser and inkjet printers. Paper is acid-free, lignin-free and buffered. Assorted colors include pink, blue, canary yellow, green and lilac.